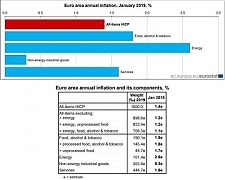 Euro area annual inflation is expected to be 1.4% in January 2019 according to a flash estimate from Eurostat, the statistical office of the European Union, informed Eurostat. Data on contingent liabilities and non-performing loans of EU governments for the year 2017 have been published by Eurostat, the statistical office of the European Union. More than 392,000 brand new mobile telephones worth altogether almost 124 million euros were bought in Estonia during 2018, a survey by BRC Market Experts indicates refferd LETA/BNS. The UK's upcoming withdrawal from the European Union (EU) will have an impact on how motor third party liability (MTPL) insurance policies work, Janis Abasins, chairman of the Motor Insurers' Bureau of Latvia (LTAB), told LETA. As of 1 January 2019, 22 out of the 28 Member States of the European Union (EU) have national minimum wages: only Denmark, Italy, Cyprus, Austria, Finland and Sweden do not have any. The 22 EU Member States that have national minimum wages can be divided into three main groups based on the level in euro, informed Eurostat. Vink Grupp, the biggest plastic products wholesaler in Europe, has acquired the company Proplastik OU owned by Estonians, Latvians and Lithuanians, reported LETA/BNS. A crime has been committed in Poland and it involved not only specific companies but also suppliers and intermediaries, Lithuanian European Commissioner for Health and Foods Safety Vytenis Andriukaitis says after Poland exported unsafe beef to Lithuania and other EU member states. informed LETA/BNS.